How does one describe a dream? Images, feelings, actions, emotions. This is how I would classify the different experiences I had when visiting Wembley Stadium today. There was no England game, no FA Cup or Champions League final, no American football exhibition, no rugby match, not even a rock concert. It was just the stadium and I and the history of the game. A late June visit to the legendary venue means one thing: one cannot do the full tour because it's concert season. Nevertheless, I went ahead with the fragment of the experience because I didn't know when or if I would have another chance to visit Wembley. It did not matter and the stadium did not disappoint. For us lovers of the game the now iconic arch over the structure is clearly visible as one approaches Heathrow airport via plane. From the ground there is no mistaking it and it is no wonder that this arch also has become the building's signature and most recognizable element. It also, as I learned today, serves as the main support for the roof. 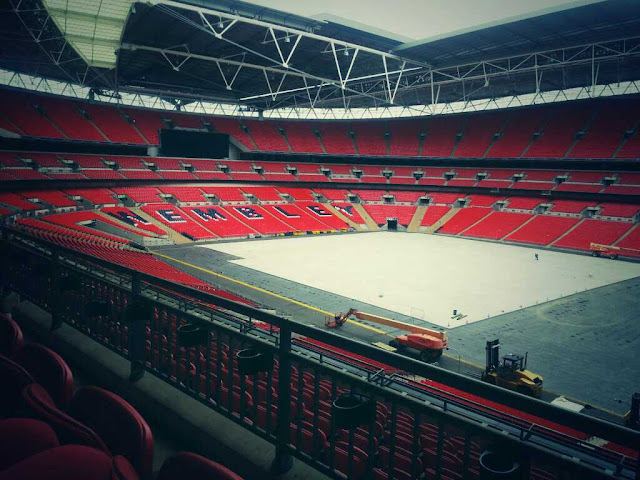 Wembley stadium is completely modern but it retains vestiges of its storied past. 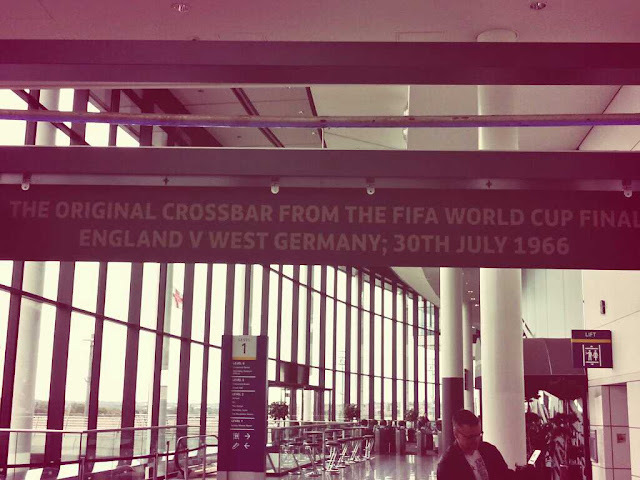 The halls contain sample monuments to the 1966 final, where England defeated Germany in the World Cup via a very contested goal. This includes a copy of the Jules Rimet Cup, a plaque with the flags of all the countries and the very post that allowed for England to win the match. The ball bounced in off the cross bar, according to the referee and English fans. German fans think otherwise. Inside the stadium the red seats reach 90,000 in number and a single person's voice bounces off every structure interminably in order to retain the maximum amount of noise. Just imagine what a game must be like. It is the history of this hallowed ground, dating back to 1923, with its numerous FA Cups, Champions League finals, and England national team games, that so reverberated with my football persona. There is a feeling of greatness wherever you walk at Wembley. From the walk up Wembley Way to Sir Bobby Moore's statue outside to echoes of soccer games both recent and past, from memories or the countless TV screens showing scenes of Beckham scoring, Messi celebrating and England winning World Cup 1966. Once you are here you understand why you love this sport. Pele called Wembley a Cathedral when he arrived at the old "Twin Towers." To me it's a monolith, a conversation, a primal feeling of togetherness and achievement. That it belongs to the crucible of soccer, England, is only right. And yet Wembley Stadium remains a treasure for all, a monument to the sport and a beacon for its fans. See more pictures at our Facebook page.